As pet owners, we all know that when you have some downtime, you want to spend it with your loved ones relaxing and creating new memories so it's perhaps no surprise that research released by a pet insurer recently revealed that there are more pets than ever in the UK getting a pet passport. One pet owner who has had a passport for his dog for some time is travel writer, Paul Wojnicki. Paul has been sharing his travel experiences with his dog Falco in K9 Magazine for some time now and this month he's excited to share his latest adventure which will make travelling overseas a lot easier for UK dog owners. Until this year it’s been challenging - to say the least - for dog owners anywhere other than the South-East to get to the continent without taking their own car. The only viable options being from Harwich and Newhaven. While the service from Hull to Rotterdam technically allows foot passengers, it actually leaves them in the middle of Europe’s largest industrial port and miles away from any realistic onward transport. Thankfully DFDS have seen the light this year and now allow foot passengers with dogs to travel on their Newcastle to Amsterdam route. The journey from Leeds to Newcastle was pleasant and swift on board the Virgin East Coast service which runs every half hour from London via Peterborough, Newark, Doncaster, Leeds and York. You’ll probably be aware that dogs travel free on UK trains and that intercity trains are no exception. We arrive several hours before our ship is due to launch because at this stage we are still unsure if Falco will be allowed to travel on the DFDS coaches that connect the city centre to the ferry terminal and I’m the sort of traveller that leaves nothing to chance. Fortunately, it transpires that Falco is allowed onboard the coach to the terminal and we’re whisked there in around about half an hour, giving Falco and I plenty of time to explore the area while the children explore the terminal with their mum. Had we realised the Wet and Wild waterpark was next door we might even have arrived a couple of hours earlier than we did. Still, never mind. I exercise Falco for a couple of hours to tire him out before we check in. The check in process is smooth with zero issues and we discover that despite the 'No Dogs' sign at the terminal doors Falco is actually allowed inside, so we sit and enjoy a drink in the cafe together while we wait to board. Foot passengers with dogs board last, which allows a more seamless process and means that they are in the kennels for a slightly shorter time. We later discover that they disembark first along with disabled passengers, which is great because Falco was itching for a sniff and a walk after an overnight voyage. As far as the crossing itself is concerned it’s fairly long, there’s no getting away from that, but in some ways, the length of the crossing is one of the strengths over rival companies in the south. The overnight service from Harwich, for instance, leaves very late in the evening and arrives very early in the morning, which means a poor night’s sleep and no time to enjoy the ship itself. No such issues on this crossing as Alena and I took it in turns to spend some time with Falco at the kennels while the other spent time with the children in the kids play areas. If you’ve got kids yourself then you’ll be well entertained on board DFDS’ crossing, their facilities were probably the best we’ve come across as far as children were concerned. As far as the kennels were concerned there was not much to distinguish them from any other ferry company. They were clean, basic kennels with water and bowls provided and an indoor area in which you could sit on a chair and keep them company for as long as you wanted. I had my phone with me and read the paper while Falco sat on my knee or sniffed around for several hours. No-one bothered us or told me I couldn’t stay there unaccompanied and we were more than happy. It’s never great when you have to leave them to go to sleep, but the same can be said of all the rival services that don’t yet provide dog friendly cabins. Disembarkation the next morning, after a delicious breakfast at the buffet, was swift and after a brief walk we were on the dog friendly coach for the short-ish hop to Amsterdam city centre. With a relatively short transfer time of around 40 minutes, this is another advantage over the Harwich crossing which can take several hours to reach Amsterdam. Built upon 90 islands, and linked by hundreds of bridges, Amsterdam’s historic centre is full of architectural delights. We spend our first few hours in the city simply strolling along the cobbled streets and canals admiring the distinctive tall 17th Century townhouses; stopping for refreshments along the way. After lunch we decide that we’d like to explore on water rather than dry land. Unfortunately most of the cruise companies don’t allow pets on board. Still, this doesn’t deter us from taking to the water and for a mere €8 per hour, we manage to pick up a pedalo right outside the Anne Frank Museum. It takes a few moments of getting used to the controls - and Falco is desperate to jump overboard for a swim - but we have great fun once we are off the main canal and exploring the quieter side streets. If you’re not feeling particularly energetic then you can hire your own private boat for up to six people for three hours (€79) or four hours (€89) from www.amsterdamrentaboat.com. But Falco is feeling energetic, especially since we only allowed him the briefest of dips in the canal, so after we drop the boat off we head to Briegijnhof, a section of the city where single women historically lived in a religious community. They were not nuns as such and took no vows, but they had to be single. People still live here to this day and the public are allowed into limited areas. It’s a haven from the busy streets and we enjoy a picnic dinner among Amsterdam’s oldest houses and an outstanding garden before heading to our hotel for the night. Smack bang next to the train station and within a five minute walk of DFDS’ drop off point on the coach, the Amsterdam Doubletree by Hilton is a great choice for all dog owners. We even managed to get a free room here by ordering the Hilton Credit card and buying our groceries on it for three months (paying off the balance in full each month of course). This qualified us for a stay in any of their hotels for one night. Thank me for the tip later! The room was of the excellent standard you’d expect from Hilton/Doubletree but the views of the waterways front and rear were the real highlight. To the front we could see the iconic Churches of St Nicholas and Oude Church (Amsterdam’s oldest building) as well as the trams and crowds on Dam Square, while at the rear of the hotel we watched the ships and boats going about their daily business on the North Sea Canal - so deep and wide we watch a cruise ship sailing past at one stage. The following morning we just have enough time to visit Albert Cuyp - a fascinating street market with something for just about everyone. The market is almost one kilometre long and we find stalls selling various fabrics, clothing food, spices, cheese, fruit and chocolate. Oh and you guessed it, dog food! It would be a pleasant way to spend a couple of hours but we linger only for thirty minutes or so, because we’ve got to head back to Centraal Station so that we can head to the romantic Rhine for three exciting days. But I’ll have to tell you about that next month. 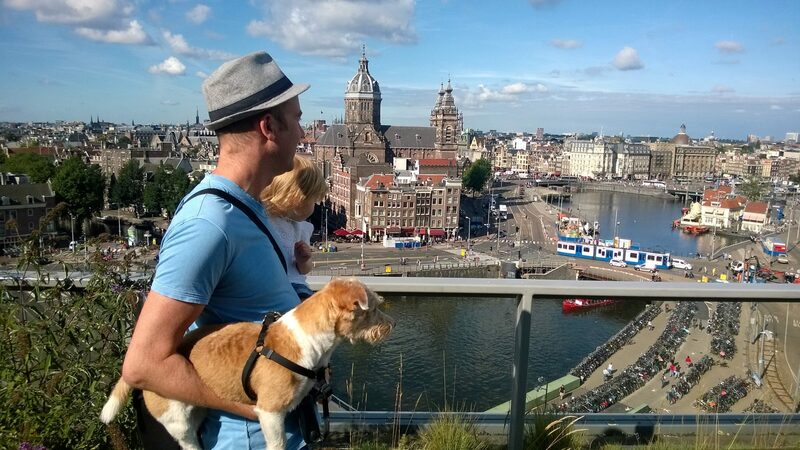 Booking.com list 128 pet friendly hotels in central Amsterdam. Doubletree go the extra mile for pet owners and even include a pet menu (just order from the iMac in the room!). We received a complimentary night by ordering the Hilton credit card and spending £750 within the first three months. This gives you a voucher for any Hilton hotel worldwide, including brands as prestigious as the Waldorf Astoria. DFDS sails daily between Newcastle and Amsterdam. The ships (either King Seaways and Princess Seaways) depart North Shields at 5pm arriving at Ijmuiden near Amsterdam at 9:30am the next morning. The return legs depart Ijmuiden at 5:30pm, arriving in North Shields at 9am the following morning. The ferries include a mix of accommodation including four bed and two bed en-suite cabins. Passengers can travel either with a car or as a foot passenger (with transfers to Amsterdam included), there are no baggage restrictions. The cruise-ferry style ships include a range of restaurants, including the gourmet Blue Riband, a mix of entertainment including free live performances, cinema, casino and children’s play areas. The ORCA Wildlife Centre onboard provides information on conservation in the North Sea and the chance to spot wildlife with the resident ORCA Wildlife Officers. Prices start from £38pp based on four people sharing a cabin and travelling by car. To book visit www.dfds.co.uk or call 0871 522 9955. DFDS are happy to accommodate pets on the Newcastle to Amsterdam route for a small cost of £19 each way, providing they are suitably secured inside a vehicle. Kennels are also available on the Newcastle-Amsterdam route. DFDS also welcome foot passengers travelling with dogs who must be booked in to the onboard kennels. Please ensure any pets are booked in advance at the time of booking. Passengers can visit their pet during the crossing by checking with the guest service centre onboard. When travelling from Amsterdam (IJmuiden) please go to the terminal building before proceeding to the vehicle check-in so the pet microchip details can be validated. Very useful things, thanks for sharing. AWESOME!